New non-intrusive reflective pH technology comes as the next evolution of our pH sensing product line. Previous PH sensor products have been based on colorimetric transmissive measurements, and have therefore fallen susceptible to ambient light interferences and sample color or turbidity effects. Our new approach uses electroformed mesh to metallize the pH sensor material, providing an optically reflective yet ion permeable membrane between the sensor and the environment. The electroforming process creates highly precise mesh sheets through atom-by-atom electrode position in a plating bath. The hole and wire sizes that can be achieved are on the order of a few microns, with sub-micron repeatability. This novel technique is ideal for our colorimetric sensor applications. 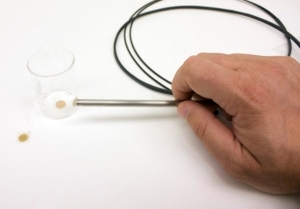 CUSTOM: IDIL can modify standard probe or manufacture specific pH probe upon request. pH probes use a proprietary sol-gel formulation infused with a colorimetric pH indicator dye. This material is coated onto our exclusive patches to reflect ligth back through the central read fiber or to transmit light through the sample in order to sense the color chnage of the patch at a specific wavelength.